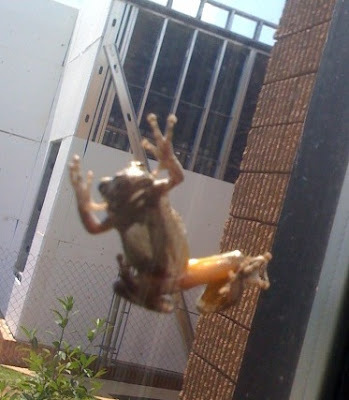 This is a picture of a frog that my wife took ... it jumped onto her window at work. This is a picture of a very weird spider that my mother-in-law found in her back yard. Do any of you know what it's called? That's cool how that frog can just climb onto the window the way it does! As for the spider, you can have them.... we've got too many of them here!